On the farthest western reaches of Soho, Studio-X NYC, part of Columbia University’s Graduate School of Architecture, Planning, and Preservation’s global network of urban research labs, offers a site to investigate, if only temporarily, possible transactions between art and architecture, New York and Lithuania. 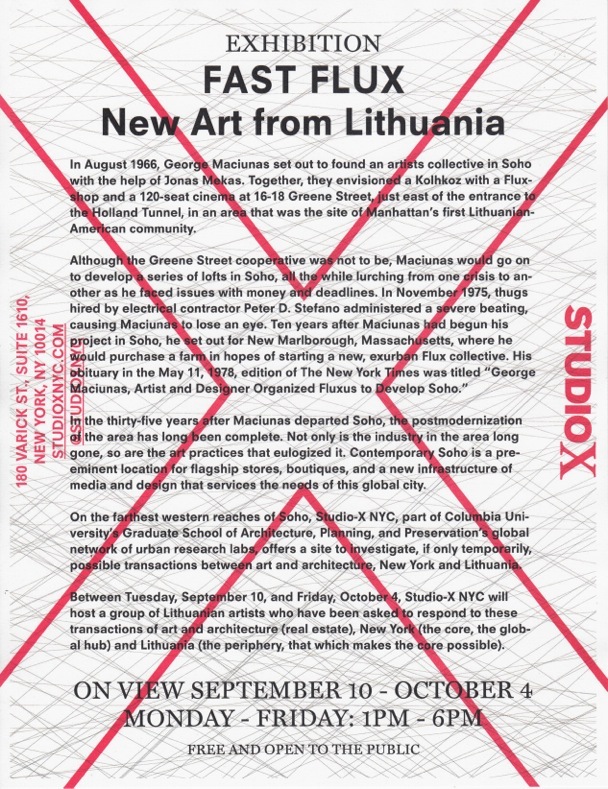 Between Tuesday, September 10, and Friday, October 4, Studio-X NYC will host a group of Lithuanian artists whose have been asked to respond to these transactions of art and architecture (real estate), New York (the core, the global hub) and Lithuania (the periphery, that which makes the core possible). A collaboration between Rupert (Vilnius, Lithuania) and the Network Architecture Lab @ Studio-X NYC, Columbia University, Graduate School of Architecture, Planning, and Preservation.